For a very long time, fat was villainized as the main culprit when it came to weight gain, heart disease, obesity and a plethora of other health concerns. Unfortunately, fat has been undeservingly painted in a negative light when it’s actually sugar that should have been receiving the bad rap this whole time. Fortunately, the media is finally starting to give sugar the negative reputation it deserves; sugar is now the appropriate villain and has been the focus of quite a few food documentaries and TV series. There is more than enough research out there confirming that high intakes of added sugars (those that are not naturally occurring in fruits, vegetables and dairy) contribute to some of the biggest killers in our modern world; obesity, heart disease, diabetes and cancers, to name a few. What’s alarming is that most people, whether they realize it or not, consume very high amounts of added sugars, putting them at a higher risk of dying prematurely from any of the abovementioned conditions. Sugar intake can be confusing because most food guides don’t have a daily recommended maximum. It was only recently that the World Health Organization (WHO) recommended that no more than 6 to 12 teaspoons of sugar should be consumed per day. Because there have been no widely published recommendations until now, sugar content on an nutritional information list is often not something that the average person pays attention to. However, a quick glance at any soda label will tell you just how much sugar is loaded into products we see everyday. One teaspoon of sugar is equal to 4 grams. If a 250ml soda contains 35 grams of sugar, that is equal to almost 9 teaspoons in one single drink. A regular size vanilla latte contains about the same. Consuming just one of these beverages puts you well on your way to exceeding the maximum guidelines set by the WHO. Given the knowledge surrounding the negative impact of sugar on the body, it is scary that sugar is literally added to everything. It is all too easy to exceed this recommendation with a single beverage or before the day has even truly begun. While paying attention to ingredient lists and nutritional information can be tedious, once you do begin to pay attention, you’ll quickly realize how many products are loaded with added sugars. The unfortunate part about this is that it quickly becomes apparent just how hard it is to avoid. While we often feel okay reaching for a “diet” or healthy snack food, a quick look at the ingredients list will tell you these foods may not be acceptable for a healthy diet or weight loss at all. Many of these products; yogurts, granola bars, protein bars, smoothies, etc. are striped of the so-called “bad” fat and other nutrients in order to create a product that is low in calories. However, once everything is striped away, there isn’t much left. The manufactures of these products need to make them sell somehow, so they make them taste good by loading them with one thing: sugar. 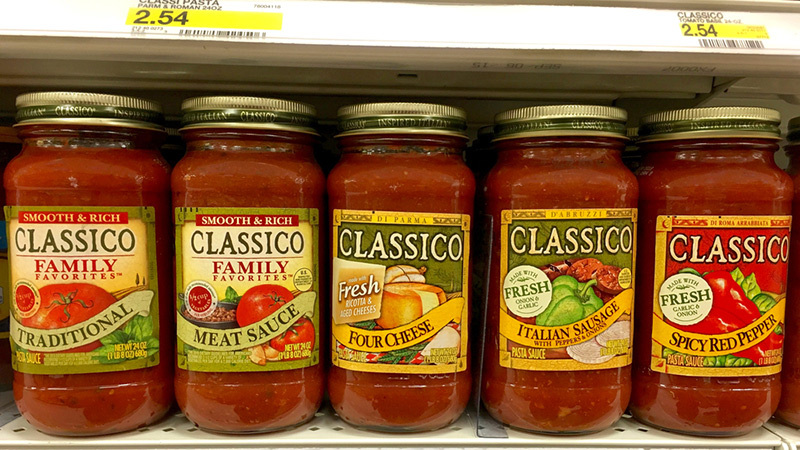 Did you know most store-bought pasta sauces have added sugar? Because we have become so primed to eat foods that are high in added sugars, our bodies crave it. Food manufactures are smart about knowing what we want and what sells. Given this primed taste for sugar, there is alarming amount added to products we may not even think of as “sweet,” making them that much more desirable without us even realizing why we may like them so much. Added sugars are often found in products like breads, pastas, sauces, soups, condiments, and even seemingly plain and bland breakfast cereals. Added sugars go by many names that we may not recognize, making it even easier to “sneak” it into an ingredients list. Common names for added sugars are: Cane juice, Dehydrated cane juice, Cane juice solids, Cane juice crystals, Dextrin, Maltodextrin, Dextran, Barley malt, Beet sugar, Corn syrup, Corn syrup solids, Caramel, Buttered syrup, Carob syrup, Brown sugar, Date sugar, Malt syrup, Diatase, Diatastic malt, Fruit juice, Fruit juice concentrate, Dehydrated fruit juice, Fruit juice crystals, Golden syrup, Turbinado, Sorghum syrup, Refiner’s syrup, Ethyl maltol, Maple syrup and Yellow sugar. Next time you reach for anything packaged, give the ingredients list and nutritional information a quick look. You may be shocked by what you see.